The museum will be closed Friday April 19 for Good Friday. 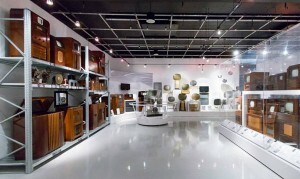 The MZTV Museum and Archive seeks to protect, preserve and promote the Receiving Instruments of Television History. Whereas other North American Museums of Broadcasting feature Programs, ours is unique in its focus on the History of the Technology, as well as on the Sets Themselves. Together with related original papers, discs, books, magazines, toys and other ephemera the collection offers some 10,000 objects to scholars and students as well as the general public. 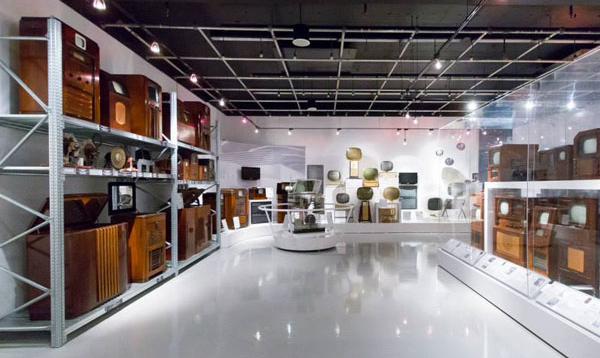 The Museum’s mandate is to exhibit the world’s most comprehensive collection of North American Television Receivers for the formative fifty-year period from the 1920s to the 1970s. The MZTV Museum also aims to tell the story of the medium and to contribute to the understanding of the impact of television on the people who watch it. Moses is best known for his outstanding achievements in television, his contributions to the Canadian music industry, and now, for his newest and ongoing role as a Champion for Canada’s 15.3 million people, aged 45plus. In the 1970s, long before Facebook, Twitter or YouTube, Moses anticipated the popularity of user-generated content. His groundbreaking television concepts, notably Speaker’s Corner, Videography, and the Studioless Streetfront Television Operating System were at the core of over 20 independent stations and channels he co-founded, including CityTV, SPACE, Bravo! and CablePulse24; not to mention MuchMusic and MusiquePlus, which served to define a generation of Canadian youth in both official languages. Among Moses’ honours commemorating his visionary contribution to Toronto’s urban landscape, the City of Toronto designated a famous downtown stretch of the legendary Queen Street MOSES ZNAIMER WAY. Today, Moses is the President of CARP – A New Vision of Aging for Canada. With approximately 300,000 members, CARP is Canada’s largest national non-profit, nonpartisan advocacy association committed to enhancing the quality of life for Canadians as we age. Moses is also the Founder of ZoomerMedia Limited (TSXV: ZUM), Canada’s only diversified media company uniquely devoted to creating content, services, and experiences for the 45plus. ZoomerMedia operates media across all platforms: National and Regional Television, (VisionTV, ONE, Joytv, HopeTV); Regional Radio with National distribution, (The New Classical 96.3FM, 103.1FM, 102.9FM, The New AM740); Digital Properties, (EverythingZoomer.com, CARP. 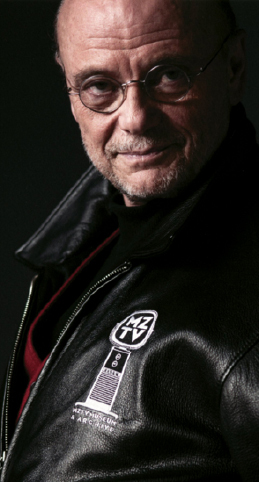 ca); Trade Shows, (ZoomerShow); Conferences, (the prestigious ideacity and ZoomerLife); and the flagship Zoomer magazine, Canada’s largest paid circulation magazine for mature men and women, in which Moses pens his “Zoomer Philosophy”. ZoomerMedia and CARP are located in The ZoomerPlex, a 2.6 acre block in Toronto’s burgeoning creative hub called Liberty Village. There, Moses Executive Produces theZoomer, Canada’s current affairs and lifestyle television show for Boomers with Zip!, and his new health and wellness series including Ask Dr. Zach with Dr. Zachary Levine, Healing Yoga, Message From Spirit with Colette Baron-Reid, and Divine Intervention with Rabbi Shmuley Boteach. The ZoomerPlex is also home to Moses’ MZTV Museum of Television & Archive housing the world’s largest collection of rare vintage television sets and associated popular culture in the world, some 10,000 objects in all. Many answers have been given to the question “Why do people collect?” Too many for comfort suggest neuroses of various kinds. Collectors do it because they feel alienated from the real world and must create one of their own. They do it to be godlike and controlling. They do it out of pride or jealousy, or to keep objects away from others. Ever the optimist, I prefer a more positive interpretation. Society turns into a culture when it shows an interest in preserving its past. In the personality of an individual collector, such an impulse to gather, preserve, understand and pass along can be highly developed. 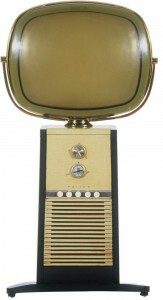 In my own case it also had something to do with a “love at first sight” response to the beauty of a Philco Predicta. I was in Peter Goldmark’s office at the time. Goldmark, who had invented the 331/3 long playing record, was head of CBS labs. I was there to marvel at a new technology, the EVR 8mm half-frame film cartridge system, which promised to do for consumer home video what the LP had done for audio. I found, however, that I couldn’t keep my eyes off an “old” television set that stood in the corner like a sentinel, like a commanding piece of sculpture. Alas, the EVR arrived at the same time as re-recordable video tape and CBS had to take one of the largest write-downs in its history. But I came away that day having seen the most beautiful television ever made; a symbol of my conviction that TV could be art, and would be my art. Once caught in this way, I set out to acquire one, and then a few other, older pieces; but experienced surprising difficulty in finding them. It struck me why: because the very ubiquity of television had led to a kind of neglect. 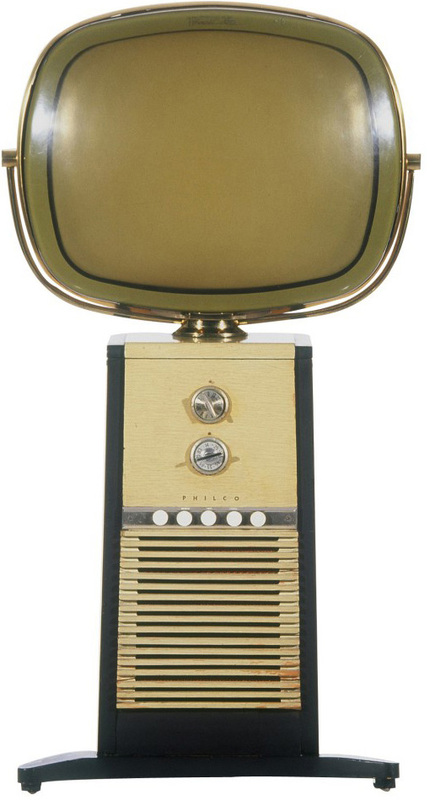 Because TV was widely seen as banal, its hallowed instruments had been devalued and lost. So it happened that I set about securing the most important of these totems – milestones in technology or design – these living pieces of furniture. In this, I “stand on the shoulders” of Arnold Chase and Jack Davis, among others, whose pioneering work immeasurably enriched the nascent collection I had cobbled together of the years, giving it form and distinction.